This is one of the four original quilt designs that Denyse launched her business with in 1996. It’s created without patterns, so each block is cut and stitched from the center out. As each block is completed, it is arranged on the wall to influence (or not) the successive blocks. 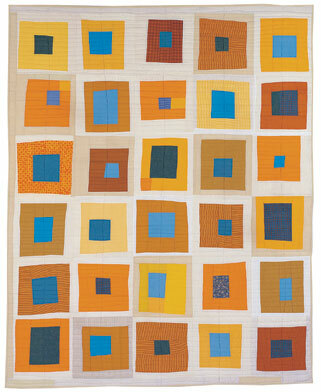 Improvisational piecing is a process more like collage or painting than traditional quilt-making. The result is that no two quilts are ever exactly alike—each is an original work of art, design, and impeccable craftsmanship.